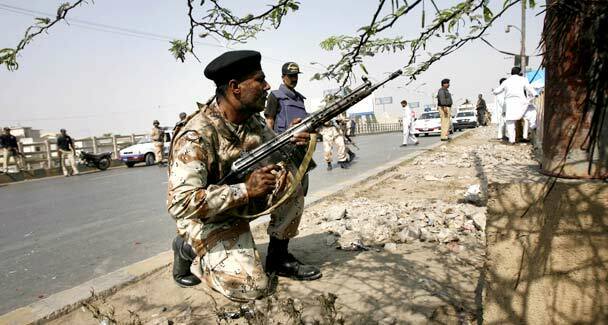 KARACHI, Wednesday, 03 Feb, 2010: A man was killed in Karachi’s Gulshan-i-Iqbal Town whereas two people were killed in the city’s Orangi Town and Qasba Colony areas. Meanwhile, a man wounded three days ago during the violence also succumbed to his injuries. On Tuesday, at least 13 people were killed in incidents of firing in different areas of Karachi in the backdrop of the Pakistan People’s Party’s main coalition partner staging a walk out from the Sindh Assembly. Meanwhile, the Sindh government has called upon holding a high-level meeting to review the province’s law and order situation, particularly in connection with the rising incidents of target killings in Karachi. Courtesy : DawnNews & Reuters. This entry was posted on February 3, 2010 at 10:46 am and is filed under Al Jihad, Al Qaida in Pakistan, Alertpak, Civil War in Pakistan, Inner Conflict of Pakistan, Lashker e Taiba, Pak Talibans, Pak Terrorism, Talibans in Pakistan, Terrorism. You can follow any responses to this entry through the RSS 2.0 feed. You can leave a response, or trackback from your own site.